Riparian areas are among the most diverse and important components of our ecosystem. Healthy riparian areas act as filters to maintain water quality, reduce streambank erosion, maintain a higher water table, provide forage and shelter for livestock and wildlife, and provide recreational and fisheries values. However, riparian areas are especially vulnerable to weed invasion because they are easily degraded by natural and human-caused events. However, riparian areas are especially vulnerable to weed invasion because they are easily degraded by natural and human-caused events. The presence of noxious weeds in Montana’s riparian areas is poorly documented. Many of these areas are difficult for a landowner to access and, in the case of many islands, it is not clear who the landowner is. It is important that we survey our riparian zones to determine the extent of weed invasion and to begin to understand how control might be implemented. The Riparian Weed Project is a collaborative effort that brings together recreationists, landowners and weed managers to work on weed mapping and control projects. 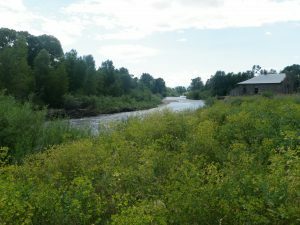 Since 2009 we have been compiling maps of the presence of terrestrial noxious weeds along the river banks of some of Montana’s rivers. Read and learn more about weed issues and ways you can tackle them.